Every once in a while when you cannot find a list or comparison on the internet, it is time to find the individual data sources and create the comparison database yourself. First it was the tallest airport control towers, then the largest airports by land area, then the longest underwater highway tunnels, and so on and so on. 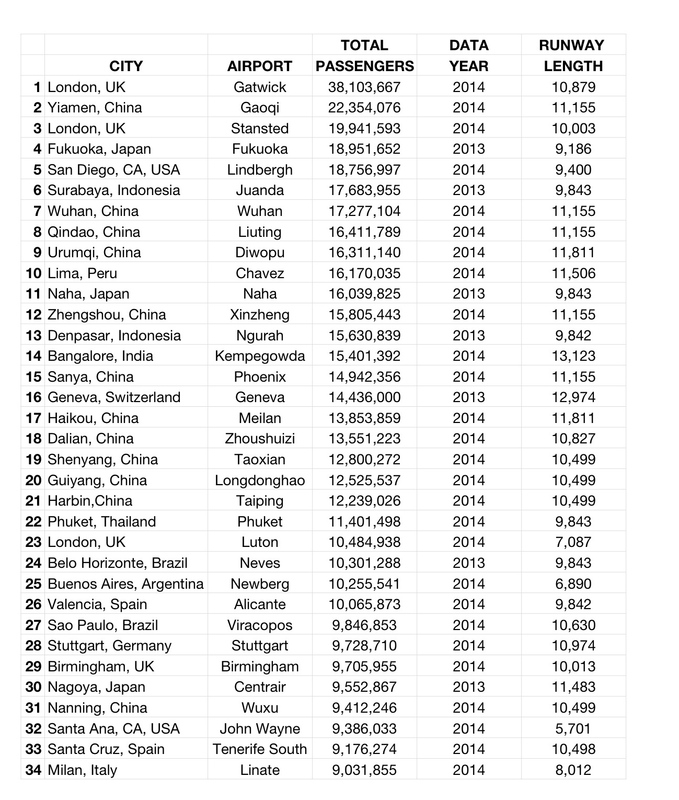 In that spirit of discovery, below is a list of the busiest single-runway commercial airports based on 2014 and in some cases 2013 passenger data. I hope the information is as useful to you as it is interesting to me. One fascinating tidbit is the only one of these airports I have personally ever flown in/out of is #1 – London Gatwick. Any updates, additions, or corrections are most welcome. UPDATE: Istanbul’s Sabiha Gökçen Airport est. 28 million passengers in 2015, which would put it in second place.. Thank you, Timur! This entry was posted in adaptive reuse, aerospace, Africa, air travel, airport planning, airports, Asia, aviation, China, cities, commerce, economic development, Europe, geography, globalization, history, India, infrastructure, land use, logistics, North America, planning, South America, Statistics, tourism, Trade, traffic, transportation, Travel, UK, urban planning and tagged aerospace, airport planning, airports, aviation, cities, land use, planning, statistics, tourism, transportation, travel. Bookmark the permalink. Don’t forget Istanbul Sabiha Gökçen Airport (SAW). It is estimated more than 28 million passengers to use this airport in 2015. First 11 monts about 26 million pax used it. It has been added – thank you. John Wayne Airport has two runways, although one is for general aviation. Oakland (California) Airport has only one runway for commercial use, and it logs about 11 million passengers per year. The general aviation part of the airport (North Field) might have one commercial charter using it. Gatwick has two runways. So it does not count. My understanding is there are too close to each other to allow simultaneous usage. If that has changed, please let me know. Alicante airport serves Alicante/Elche city, Valencia is completley different airport. Hmm? May need an update. How about Dublin airport. It has two landing strips, that are crossing each other, so effectively only one runway is used at any given time. It should count, i think. Thank you for the suggestion, but including Dublin would then include a lot of other airports designed in the same way, which would defeat the purpose of the post which was to list airports with just one useable runway.